Viva Health Club WINS at the Local Business Awards 2016! 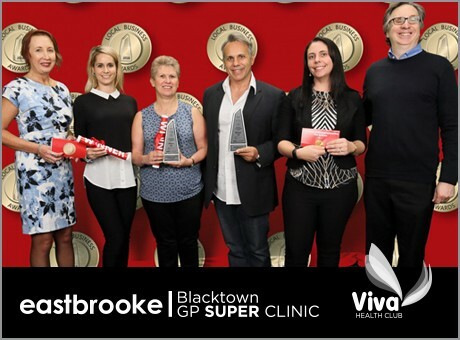 Staff and management of the Eastbrooke Blacktown GP Super Clinic and Viva Health Club attended the Blacktown Local Business Awards presentation evening on Tuesday 10th May 2016. This annual prestigious event was held at Blacktown Workers Club and acknowledges the outstanding local business and their staff who go above and beyond – providing an exceptional customer service experience. During the past 30 years, the Local Business Awards Trophy has become a powerful symbol that local businesses aspire to. Guest speakers such as Blacktown Council representatives, Blacktown Workers Club officials and members of the Rotary Club of Blacktown City were included throughout the presentation. Viva Health Club is located within the Eastbrooke Blacktown GP Super Clinic on 112 Main Street, Blacktown.